The ION Classic LP is a hybrid hardware/software turntable that allows you to play all your vinyl with warmth and clarity and also create a digital archive of your classic recordings through EZ Vinyl Conversion software accessed through USB connection to a computer. The Classic LP is constructed with a non-resonant wooden base in a piano-black finish and features a hinged dust cover and a felt slip-mat to protect your records. The ION Flash Cube is a wireless speaker featuring a 5 1/4 woofer and wide-dispersion tweeter with multicoloured LED lighting effects. The Flash Cube streams music wirelessly from any Bluetooth device and includes a remote to control music playback and lighting functions. 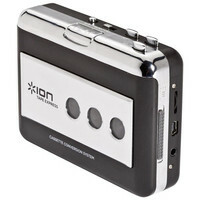 The ION Tape Express Tape-To-MP3 USB Audio Adapter is the perfect device for bringing your old tape collection into the 21st Century. Connecting to your computer via USB the Tape Express is able to convert your cassettes to MP3 format using the included EZ Vinyl/Tape Converter software. It also features a 1/8 audio output so you can listen to your tapes with headphones or by connecting to a stereo or other speaker system. 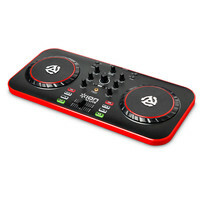 The ION DJ Live is a USB controller featuring dual touch-sensitive platters crossfader and EQ controls as well as multi-function buttons. 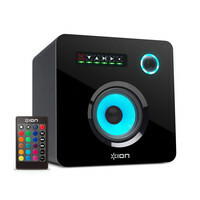 The ION DJ Live includes Pro DJ software for manipulating your collection in real-time. The ultra portable lightweight design lets you DJ anywhere with USB power from your laptop. 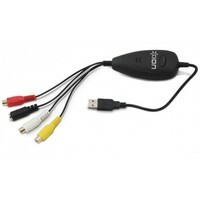 The ION Video Forever Cable allows you to transfer your classic videos from your VCR or other video device to your PC via USB. 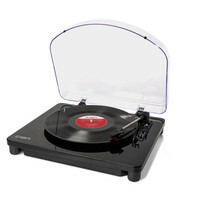 The ION Max LP is an all-in-one turntable that allows you to convert your vinyl records to digital music files on your computer via simple USB connection and EZ Vinyl/Tape Converter software. A 1/8 aux input lets you convert audio from cassette players and more. 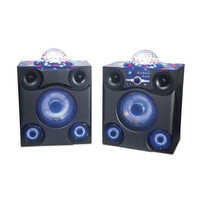 Built in stereo speakers are also featured for quick and easy listening or connect directly to your home stereo system using standard RCA outputs. 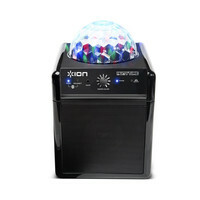 The ION Party Time Speaker allows you to stream music from any Bluetooth device and play it through the convenient and portable designed speaker whilst the in-built light effect fills the room and pulsates in time with the beat. 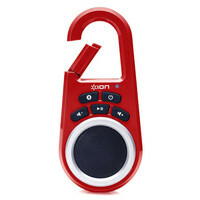 Non-Bluetooth devices can be connected using a 1/8 input and the speaker can be used as an audio-only solution by turning off the light effect. 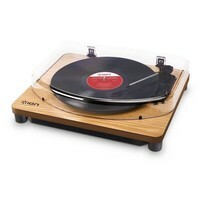 The ION Classic LP is a hybrid hardware/software turntable that allows you to play all your vinyl with warmth and clarity and also create a digital archive of your classic recordings through EZ Vinyl Conversion software accessed through USB connection to a computer. The Classic LP is constructed with a non-resonant wooden base in a natural wood finish and features a hinged dust cover and a felt slip-mat to protect your records. 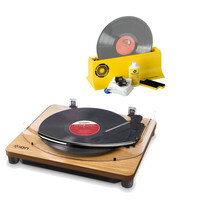 This bundle also includes the Spin Clean vinyl cleaning system enabling users to clean both sides of the record simultaneously. The ION Film 2 SD Plus High-Resolution Scaner allows you to quickly and easily convert your 35mm slides and negatives to digital files. Featuring a built-in SD card slot the Film 2 SD Plus is able to save your images directly onto an SD card with no need to connect to a computer. 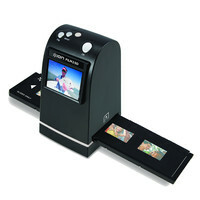 The full colour LCD screen allows you to see your scans as you work or alternatively you can connect the device to a computer to instantly share your revitalised images. 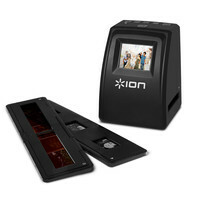 The ION Film 2 SD is a portable high-quality scanner which lets you convert your old 35mm slides and negatives into digital files without any need for a computer. The scanner transfers the images directly onto an SD card and the large full-colour LCD screen lets you see the results immediately. Alternatively the device can be connected to a computer for instant sharing and can also be used as an SD card reader. This item was returned unwanted from a customer. The original boxing is scuffed. Otherwise the unit itself looks and operates as new and has only been used a couple of times. This is a great opportunity to buy a fully functioning product at a discounted price supplied with a one year warranty. The ION Clipster is an ultra-portable full range speaker with an impressively loud crystal clear sound and a striking Blue finish. Able to wirelessly stream music from any Bluetooth music player including iOS and Android devices this compact speaker clips securely to a belt loop or backpack so you can easily listen to your music wherever you go. The ION Clipster is an ultra-portable full range speaker with an impressively loud crystal clear sound and a striking Red finish. Able to wirelessly stream music from any Bluetooth music player including iOS and Android devices this compact speaker clips securely to a belt loop or backpack so you can easily listen to your music wherever you go. 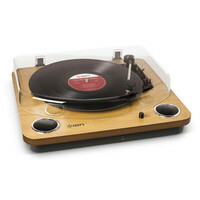 The ION Classic LP is a hybrid hardware/software turntable that allows you to play all your vinyl with warmth and clarity and also create a digital archive of your classic recordings through EZ Vinyl Conversion software accessed through USB connection to a computer. The Classic LP is constructed with a non-resonant wooden base in a natural wood finish and features a hinged dust cover and a felt slip-mat to protect your records. The ION Shutter Pal Bluetooth Selfie Stick allows you to capture better selfies with a telescopic arm that extends to 1 meter giving you the perfect perspective for your photo. 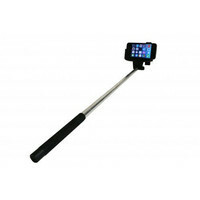 An integrated Bluetooth trigger button in the handle makes it easy to take photos with the arm extended.